Today I want to talk to you about 3 things you need on your website. For those of you that have implemented those, you’ll love what I say because you’ll think, yeah I did that. That worked really well. The reason I’m telling you is to help you out. The reason I’m doing it for free is because I enjoy helping you out. Honestly. And the other reason I do it for free like this is because it frustrates me that this information is available but there is nowhere to learn it. You just can’t. Anyway, enough about that. So here are the 3 elements you need to have on your website. There are many. To actually pick 3, was kind of tricky. Now you’re thinking, oh high quality, what does he mean? Your iPhone and your android takes incredibly high quality images. They are good enough. But large images. Put large ones on your website. Some places you have to have little thumbnails. That is fine. But on the actual post, large images, because people want to share them, because they like your post. They want to share your post on Pinterest. Pinterest is going to pick a large image. Looks better. They want to share it on, they want to put something on Facebook, and on twitter. Larger images look better. Okay. So, and it stands out when you’ve got good images, look at any website, that’s got, that’s old fashioned, and it’s got little ones, built back in the day when big images took forever to load. Not like that anymore. Not if you’ve got a good website. Doesn’t work like that. Everything is fast, I mean you can play, you watch Netflix on your phone, it all is fast these days. So that is, that is important. Oh in Instagram and Snapchat, you know everything is visual. Just trust me. That’s number one. Everybody is likely to have an About Us page, whatever you call it. Personally I would say something like that. Just stick with the basics, people know what it means like Contact us, about us, people know what that is. It’s going to be probably the second most popular page on the entire website. So make it about you. Or about the company. People don’t trust you because they don’t know you. You are online, you could be anywhere, you could be in China, in Russia, in Yemen, in Afghanistan, in Hong Kong. Who knows? Doesn’t matter. They don’t trust you. So on your website don’t say all the products and services you do. They want to know about you. Who are you? What do you look like? What are you scared? And by the way if you don’t put a picture there, why not? What are you scared of? Okay, think about it. So they want to know about you. Tell them about you. Tell them your why. Tell them why you set up the business, tell them the history of the business. People want to know. Just helps them trust you. Doesn’t matter if you’re not selling anything, if you want them to comeback, they want to get a relationship and a connection. So that is a must. So every single page of your website should tell somebody what to do. What you want them to do. SO they read down the post, ba ba ba ba ba. They read it all, they get to the end, just imagine, imagine there’s something now, what next? What now? Now what? What do you want them to do? Call us. If you are going to say, call us. Call us on, and write the phone number. Don’t say, ‘oh it’s printed at the top of the website.’ By now they are at the bottom of the website, they can’t see the top. No some are on mobiles, they are in a hurry. Why wouldn’t you do? What’s the…? Anyway, call. If you are going to say, or contact us, put a link to your contact us page or write your email address. Then they could just click it. But a call to action, and on your homepage if you want people to sign up on the list. Tell them to do it and give them a reason why. 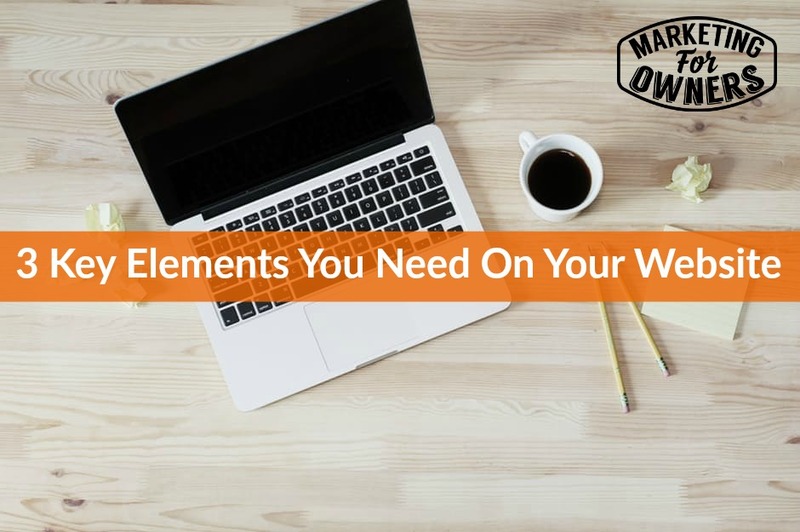 Those 3 are the elements alone will transform your website. And how simple is that? There you go. Giving this away for nothing. Anyway, quick one. It’s Monday Book for the Week. 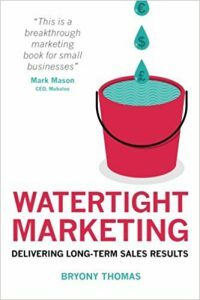 You need to check out Watertight Marketing by Bryony Thomas. She’s lovely. She’s from the UK. Her book ‘Watertight Marketing’. It’s a full walk through of everything you need to do about marketing. She’s very very good. I highly recommend it. Honestly it’s got pictures as well. And she talks about leaky buckets and all these things. It all makes sense. Watertight Marketing, Bryony Thomas. A great read. I promise you. Get it on Amazon or Book Depository. Be sure to come back tomorrow for more great tips and a Toolbox tip you won’t want to miss.